President Obama announced new rules that limit the amount of carbon pollution that coal plants can emit into the air that all of our families breathe. This is the first time that coal plants will be required to regulate carbon pollution. Bold Nebraska’s energy policy is simple: no tarsands, less coal and more renewables. The simple fact is coal plants have been given a free pass on pollution that always gets passed on to communities and families in the form of higher health costs. It’s what is called “the hidden costs of fossil fuels.” They keep producing more coal and oil and yet our energy costs continue to go up. The promise of “lower energy bills” never materializes with just adding more fossil fuels to our state. All the while, kids asthma levels go up and water gets polluted. 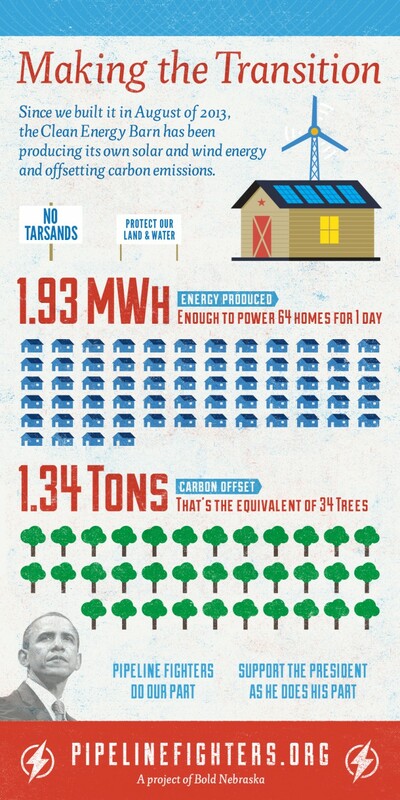 The only way our energy costs go down is to diversify our energy base while conserving the energy we produce and use. Period. When you think about tarsands, the hidden costs are often related to the economic damages of spill clean-up that gets passed on to landowners, fire departments and communities. If corporations are going to produce carbon and other forms of pollution, they should simply have to pay for those costs. We know our country will use (hopefully in declining amounts) coal and oil, but that does not mean they get to bully landowners and it certainly does not mean they get to ignore the full costs of their energy production. We must make the transition NOW to clean and local energy. We thank Pres. Obama for taking this step and look forward to more brave decisions like denying the Keystone XL pipeline. States will now set goals with flexible way to reduce carbon pollution: more from the EPA. ACTION: comment on the power plant rules or attend a hearing in Denver, directions on the EPA website.